Funny the stuff you see on the side of Postal Boxes. 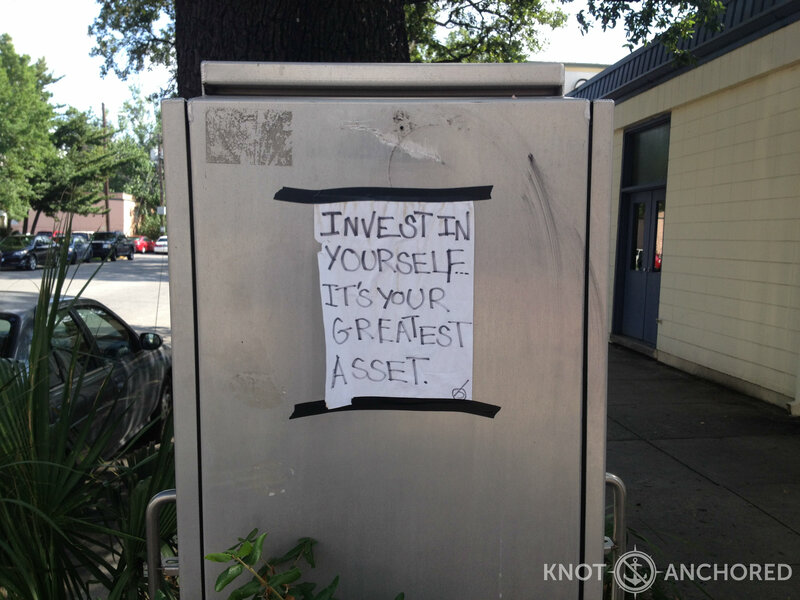 We saw this posting in Savannah while we were waiting to cross at the lights. Bet this street philosopher didn’t think this would turn into a blog opener! It’s true though and everyone should do this. Steve and I are taking a safety course for our own peace of mind, as we will be reliant on each other if emergency’s arise at sea. All the other students (15) are taking this to pursue or enhance their careers on the world’s oceans. We’re taking this at International Crew Training in Ft Lauderdale and it is one of many courses they offer. Check out their website at yachtmaster.com/course-list. If you ever dreamed of working on a yacht be it in the Caribbean, Mediterranean or even Alaska YOU CAN. The Standard of Training Certification and Watchkeeping (STCW95) is a mandatory international safety course for anyone who wants to try this out for size. Your a musician. You need this. Your a chef. You need this. Starting off as a deck hand? Yup need it. 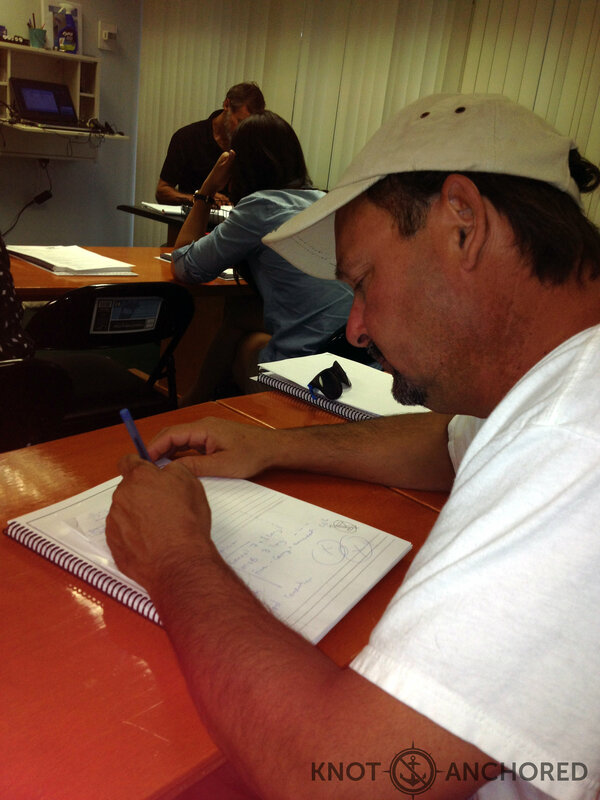 Once you have this basic 1 week course you open up a world of opportunity for working on the water. You will still need to sell yourself, be presentable and substance free as working on a yacht has a zero tolerance policy on vices. Most jobs on land make these demands on people, why not see the world and work on a yacht or a cruise line? 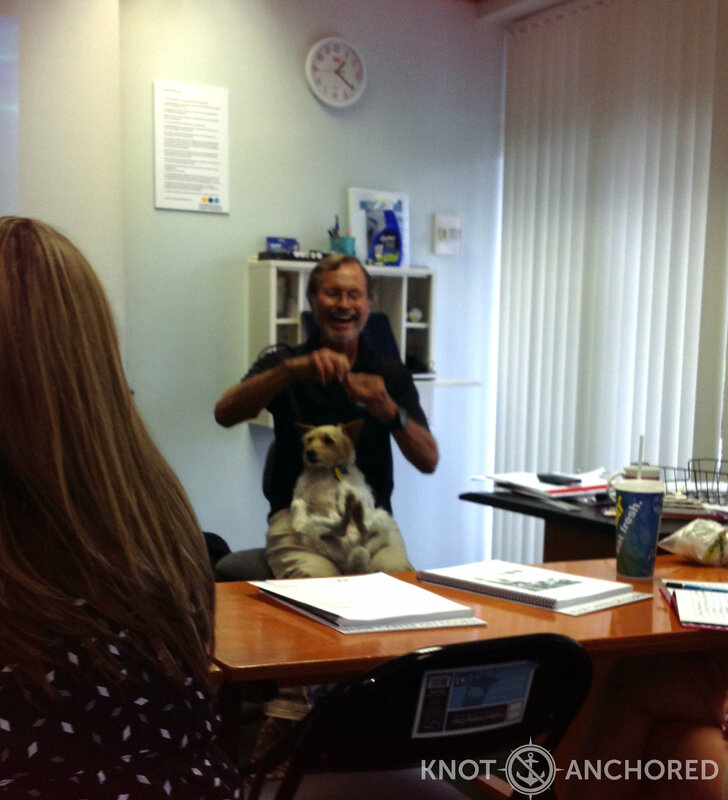 This is our instructor and his adorable sea faring mate Gatsby. As we sat in the classroom Gatsby had a little panic attack because of the thunder outside so Captain Doug helped calm his shivering. Tomorrow we meet at 7:30am and head to the water to tread water, swim test, don Immersion Suits, right the overturned safety boat and perform some group in-water manoeuvers. Every chapter comes with a test. Tonight will be an early one. ps WATCH OUT FOR PIRATES!!! Steve, you beautiful man, thank you for coming into my beautiful daughters life. Her soul in in your hands, and I believe, visa versa. All the best to you love. I hope you enjoy the little sardines that are coming your way on the 23rd. Thanks Mishu and Norm we are very much looking towards our little sardines 🙂 We are very happy in our new adventures. Your support and encouragement is wonderful. Thank you. There is so much for me to say, and, unlike Krisia, I don’t have the words. You are doing exactly what you should be doing – sharing your your love for each other and for this blessed world we live in. I think we have only one life to live, and it means the world to me how you are living it – so near, but so far, you are both in my heart.